The term reinvention is thrown around too much in our business. In fact, we’d prefer to say we’ve taken an all-time classic and just kissed it with our trademark Onyx Cold Brew. All be it a kiss you’re not likely to forget in a hurry, the flavours on display to celebrate Campari’s Negroni Week are a testament to our dedication to a cold brew that is a perfect match with any coffee cocktail; past, present – and we’re pretty confident – future. Tried and tested, we love this recipe. The Chesterfield Grappler was concocted by Onyx’s Head Distiller, Pete Clarke in his own Bar Toto on the Central Coast, NSW. The same coastal hot-spot where all Onyx flavours and recipes are tested once they’re ready to come out of the lab. 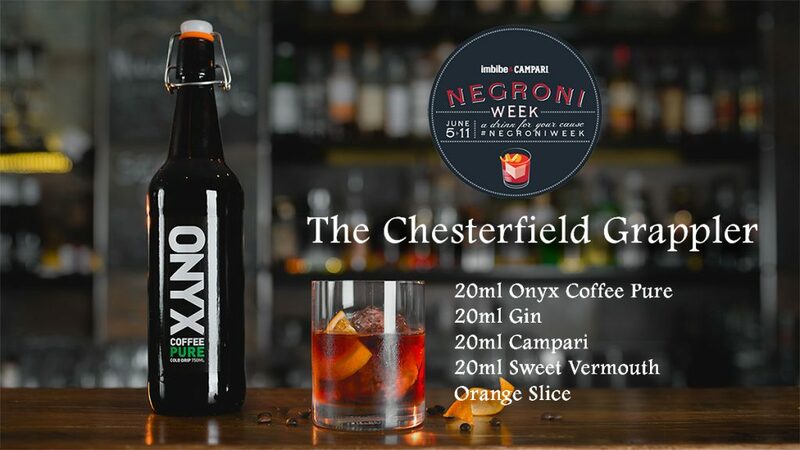 “What makes The Grappler recipe stand out from your average cold brew Negroni is without a doubt our Onyx Coffee Pure. 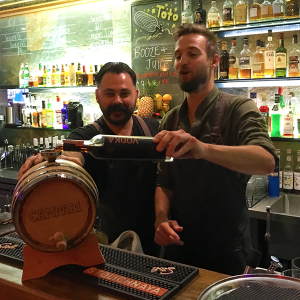 Onyx Founder Mitch and Head Distiller Pete mixing up a pre-batched version of The Chesterfield Grappler at Bar Toto. They had a bit of fun with this one. Seasoning the barrel with Onyx Coffee Vodka for 14 days, then adding The Chesterfield Grappler into the cask to age for another 4 weeks. We have developed our cold brew recipe to harmonise with varying flavours and textures from many a cocktail, and none more so the classic Negroni – a customer favourite. Combine this with the bitterness of the Campari, floral notes of the gin, and the sweet and spicy cinnamon tones of the vermouth, the Grappler dances with zest on your palate” says, Pete. We’re sure you love a Negroni as much as we do. So get in contact about getting a taste test by contacting us directly on 02 8880 5296 or in the enquiries section.